You consider yourself a cultured guy. When you visit a new city you want to learn the local customs, get a taste of the local cuisine and to dive into the art scene. And with some of the world’s best restaurants, amazing bars, world class museums and a thriving theater scene, there’s no better city to practice being a sophisticated and cultured gentleman in than London. Seeing a show in the West End, the city’s famous theater district, should be at the top of your list of things to do in London. But chances are you’ll only be in London long enough to see one show — and picking just one can be a challenge. I was recently in London for quick trip (just 2 days) and was faced with this predicament. So many worthy shows to see, so little time. While the city isn’t short on famous, long running musicals like Les Miserables, Phantom Of The Opera, Mamma Mia, The Lion King, Billy Elliot and The Book Of Mormon, I didn’t feel like seeing a musical so I narrowed it down to plays. And with just one night to experience London’s theater scene, I wanted to see a play that is synonymous with the city and something that would be guaranteed to please. That left just one choice: War Horse. You may be familiar with the 2011 movie War Horse, which was directed by Stephen Spielberg. 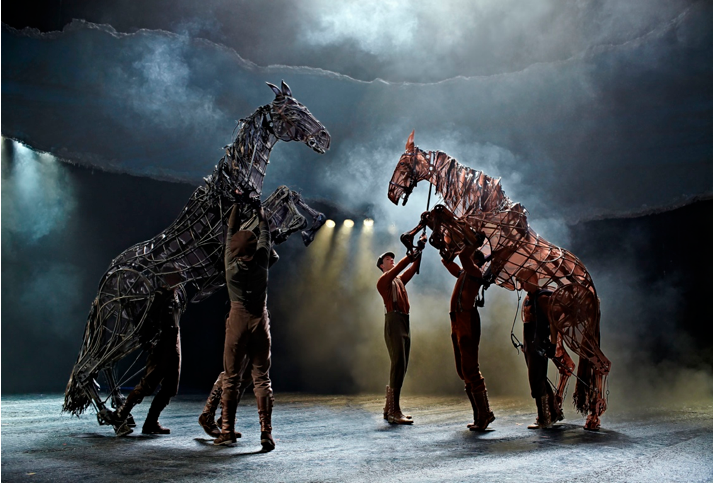 But the play War Horse, which is based on the 1982 novel of the same name, has been playing on the London stage since 2007. 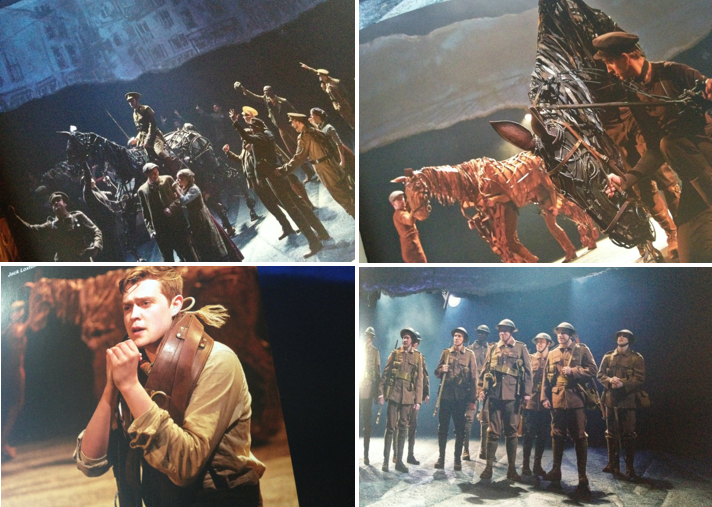 Since then, War Horse spent almost two years in New York City and touring performances have been seen around the world. But this quintessentially British story, which takes place in England and France from 1914-1918 surrounding World War I, is one most fittingly viewed in London. For those unfamiliar, here’s an incredibly basic plot summary. The story centers around Billy, a poor farm boy in his teens and his horse, Joey. As the two grow up and struggle together, they become inseparable, until Joey is sold to the cavalry to serve as the horse to a lieutenant in WW1. A short time later, Billy, fueled by his quest to find Joey, joins the armed forces and goes to fight in France. I won’t ruin the ending for you. Going into this play, I didn’t know exactly how the horses would be portrayed and brought to life. I knew there was puppetry involved, but before seeing War Horse, when I heard the word “puppets” I though of children’s TV shows with fuzzy animals or characters like Pinnochio. That notion was quickly shattered when a young Joey, controlled by the masterful members of the Handspring Puppet Company, appears on stage. These aren’t puppets, these are pieces of art brought to life — a fact that is fully realized when we meet a full grown Joey. He and other horses are controlled by three people, one controlling the rear portion, one controlling the front portion, and one standing next to the horse controlling the neck and head. All three work in harmony, creating the smallest nuances like a flick of the tail, a twitch of the ear, and the rise and fall of a breathing chest, which makes the audience almost forget the puppeteers are there and believe they’re watching a real horse. As the story progresses from beginning to end (the play’s runtime is 2 hours and 40 minutes), moments are lively, somber, bittersweet, happy, tense and triumphant. It’s a moving tale and one that is suitable for most audiences, especially male audiences, who speaking as a member of that audience, are often hard to please. 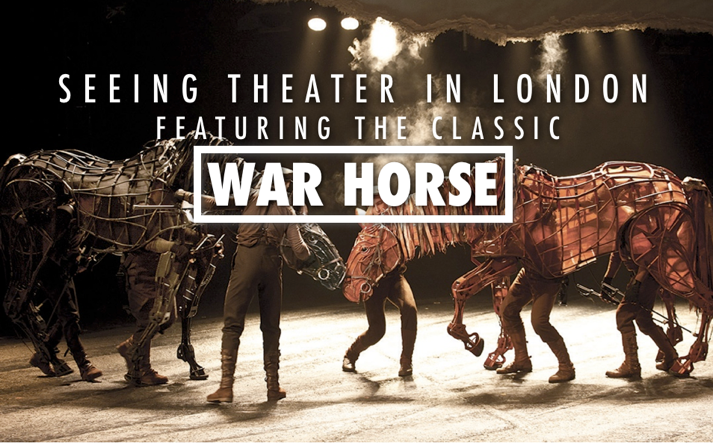 So if you have a night in London and are looking for some culture (don’t worry, the pubs will still be open afterwards), War Horse has been, is, and will continue to be the city’s must see play. Tip: The show’s theater, The New London Theatre, is a modern, open yet intimate space with almost no obstructed views. While there are really no bad seats, in my opinion, I wouldn’t sit right up front. While this may give you an up close look at the puppeteers, you may miss out on the bigger picture. Book tickets in the “stalls” (a.k.a. lower level) and choose a straight on view no further back than row M, as the theater’s upper level may slightly block your view of the projections which appear above the stage. If you’ve seen War Horse or are looking for something different, check out my curated list of performances playing now and coming to the London stage in 2015 that I’d like to see. Once – Based on the movie (which one the Oscar for Best Original Song for ‘Falling Slowly’). On now. The Curious Incident Of The Dog In The Night-Time – The seven times Oliver award-wining (it’s like the Tony Awards) play based on the novel. On now. Man and Superman - Starring Ralph Fiennes. Begins February 17, 2015. Sweeney Todd – Starring Emma Thompson. 13 performances only. Begins March 30, 2015. And if nothing above strikes your fancy, there’s always the musical adaptation of the movie, Bend It Like Beckham, which debuts in May and is sure to delight teenage girls everywhere. Special thanks to TheatrePeople.com for providing me with tickets to see War Horse.